We’re looking for an engineer to join our team at the growing Pieminister Kitchens. The main responsibility is to carry out required electrical and mechanical maintenance to maximise equipment up-time whilst minimising costs. The ideal candidate will have several years’ experience and ideally be from a food or FMCG background. You will need to be proactive, flexible, have high standards and plenty of energy to bring to the role. To complete all predictive, preventative and corrective maintenance tasks as detailed in the departmental work load plan generated by the maintenance manager. Develop and implement improvement plans for allocated equipment to increase efficiency. Develop an atmosphere of change that will positively contribute towards the advancement of all functions relating to the manufacturing operation. From Pieminister’s humble beginnings, selling pies at music festivals and market stalls, we have now grown to over 15 restaurants and have ambitious expansion plans to roll out more restaurants up and down the country. 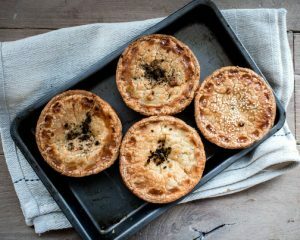 Pieminister is a multi-channel business developing pies (and other products) for Pieminister’s restaurants, cafes, brand licenses (which include pubs and leisure venues) and independent retailers, delis and supermarkets. Pieminister also host pie and mash weddings, cater for corporate events and feed festival goers in the summer. Pieminister is still a family owned business and has 150 pie experts making over 6 million pies a year and up to 95,000 pies a week in Bristol during peak times. Pieminister is the UK’s only national pie company to use 100% free range British meat. And the provenance of ingredients is a key part of what Pieminister stand for. Pieminister also has a strong commitment to animal welfare and redistributing waste through our Little Acts of Pieness initiative (where we give people frozen pies to raise money for charity). We have also been recognised as one of the 1,000 businesses to inspire Britain, won awards for most of our pies and are hailed in the press as the saviour of the British pie. Pie Day Friday – so lunch on us every Friday! This role is based in Brentry in North Bristol (5 min away from M5 J17) and is Monday – Friday, although with the ability to flex to business requirements (including weekend and/or evening and night shifts) is required.